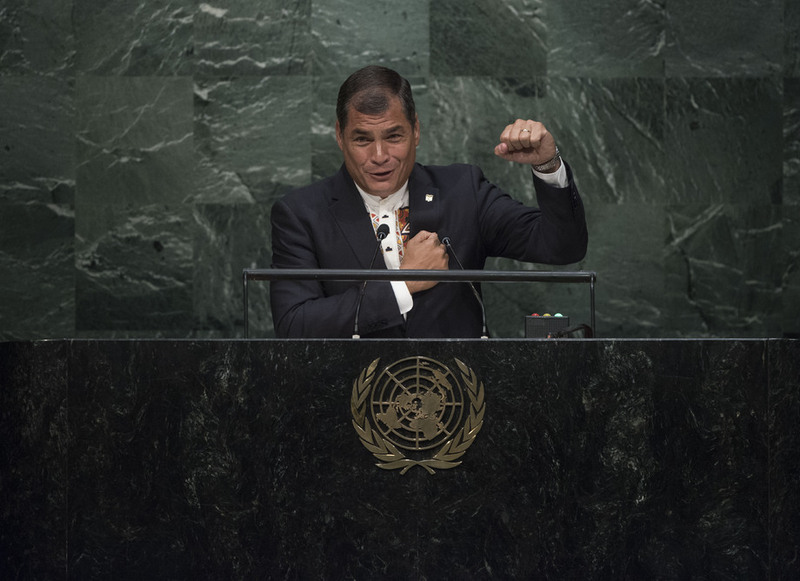 RAFAEL CORREA, President of Ecuador, stressed the importance of viewing peace not as the absence of war but as the presence of justice, dignity for life, and development. Quoting Mahatma Gandhi, he said “poverty is the worst form of violence.” The Community of Latin American and Caribbean States (CELAC) had declared the region as “the zone of peace”, but poverty prevailed, with 164 million people living in poverty and 68 million people in extreme poverty. People were waiting for justice and real democracy, not periodic elections. Poverty was not a scarcity of food, but rather exclusion by the power structure. With inequality prevalent, he said, the international community could not settle for “minimalist” goals, such as the Millennium Development Goals. Quoting the Secretary-General, he said that the aim was “not just to keep people alive, but to give them a life — a decent life”. It was vital to pursue maximum goals and benefits for human beings and nature. On the issue of migration, he said, it was regrettable that human mobility was omitted from the 2030 Agenda. Capitalism promoted free movement of merchandise. Penalizing people for moving to have a better life was not right. Seeking more borders was not the solution; solidarity was. Turning to climate change, he expressed serious concern about growing greenhouse gas emissions and highlighted the unfairness of countries that produced fewer emissions bearing the brunt of climate change. Ecuador, for instance, contributed 0.1 per cent of global carbon dioxide emissions, but significantly suffered the consequences of global warming, he said, proposing a universal declaration of the right of nature. For climate change adaptation, it was imperative to bridge the technological and scientific gap between the rich and poor countries. If two apples were exchanged between two people, each person could enjoy one apple. But if two ideas were exchanged between two people, each had two ideas. The problem was knowledge and technology was costly. Ecuador would host the Habitat III conference in October 2016, a forum to formulate a new urban agenda to create inclusive cities, he said. Finally, he denounced exploitation of natural resources and environmental damage by transnational companies, such as Chevron, calling on Member States to adopt a binding treaty to sanction companies that violated human rights and damaged the environment. He said Ecuador would use a “lethal weapon”, which was the truth, to back its claims against the companies.